They’re rugged, wild and oh so beautiful. 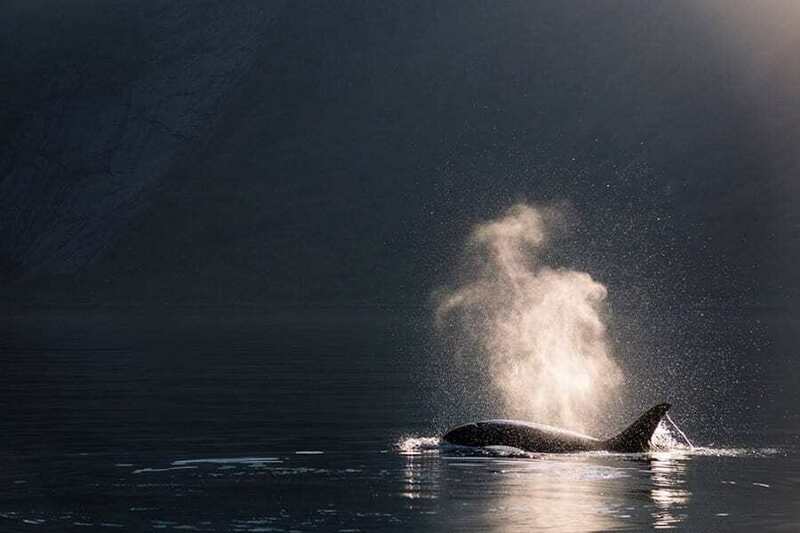 The Lofoten Islands are fast becoming one of the most popular destinations for photographers and this guide will show you all the best locations to capture the scenery from all angles. 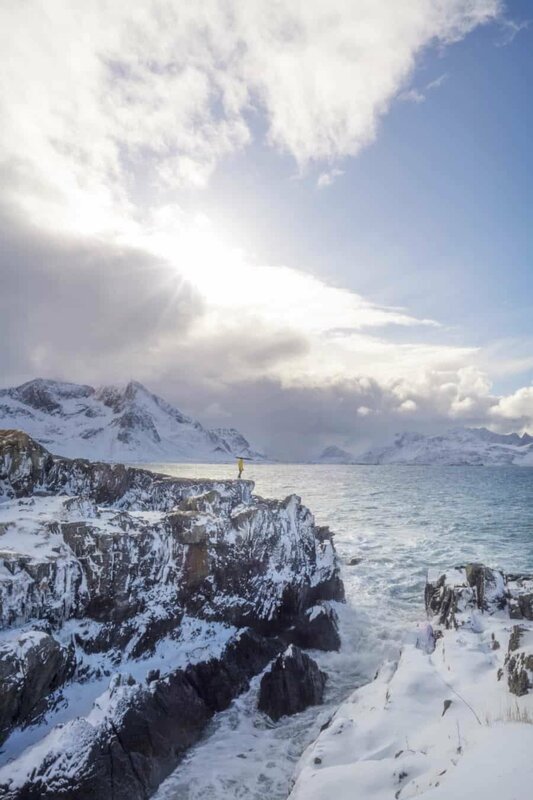 Whether you’re visiting for an adventure packed trip, hiking mountain peaks and kayaking fjords, or if you’re keen for a road trip exploring at your own pace, you’ll be wowed by all that Lofoten offers. 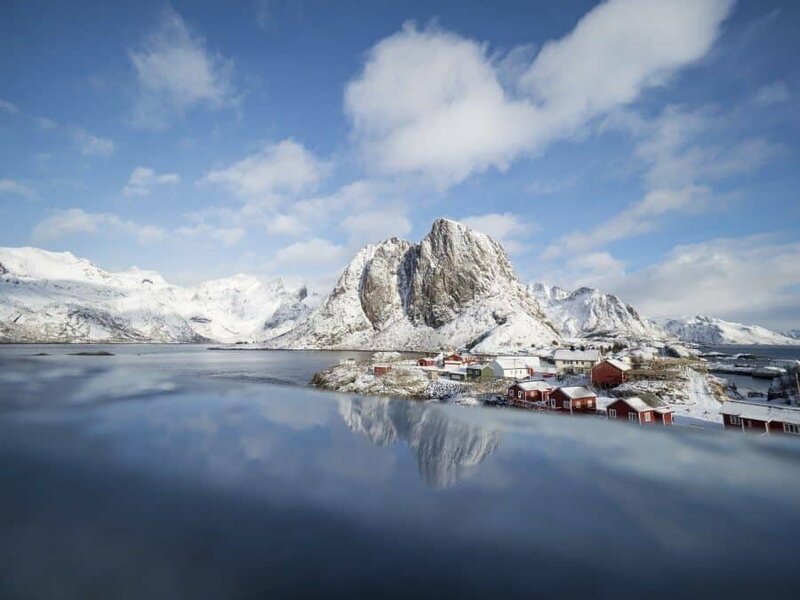 Located in Northern Norway above the Arctic Circle, the Lofoten Islands are a snow covered wonderland in winter and a sparkling lush outdoor dream in summer. Ever changing weather will keep you and your camera occupied with bright blue skies, moody clouds and striking storms that show the full force of nature’s power. Some days you’ll have calm winds creating picture perfect reflections from every angle, others fierce winds will bring giant waves that are equally as photogenic. 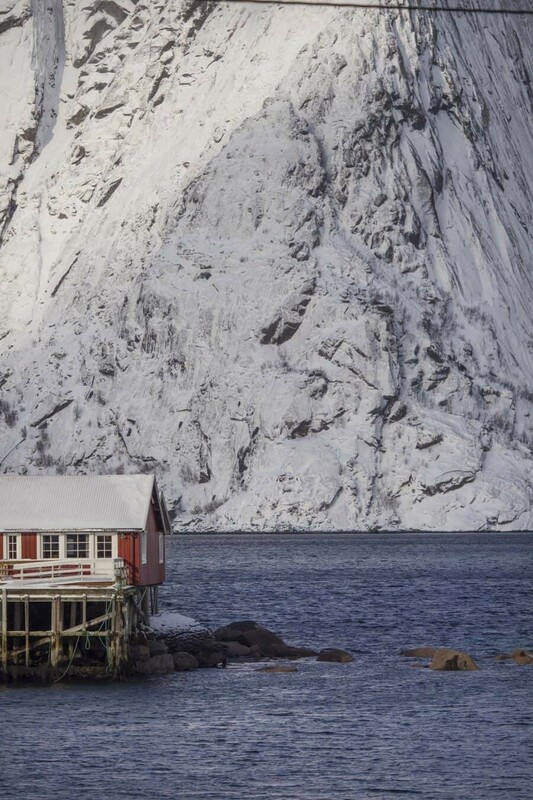 Be prepared for anything and you’ll love Lofoten. All of the images you see below in this guide were taken in March so expect to replace the snowy scenes with a lot more green in summer! 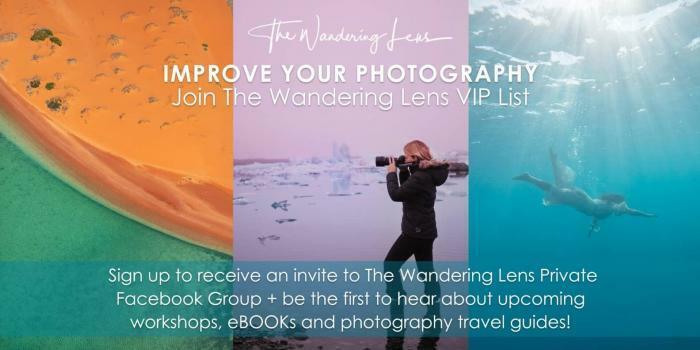 As with all of my destination guides, you’ll find each location noted below with sample photos and a description of why you should visit. 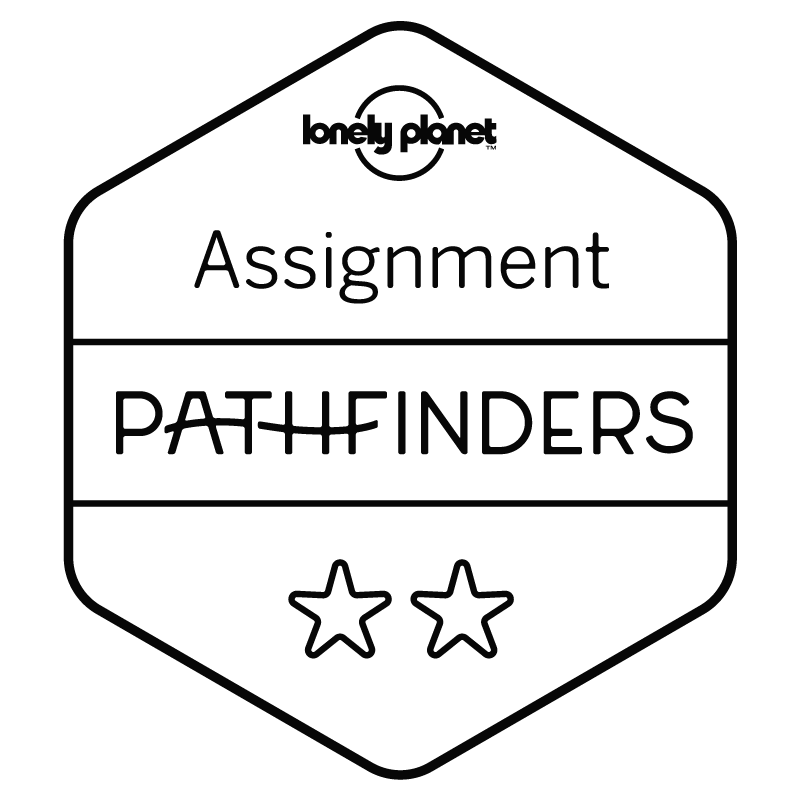 Scroll to the bottom of the guide for a map to the Lofoten Islands which you can open up in Google Maps and take with you while exploring. If you have an Instagram account you’ve no doubt seen this scene many times before. Heck, if you’ve googled the Lofoten Islands even once I’m sure images of this spot came up in the hundreds. Hamnøy Bridge is perhaps the most popular photography location in Lofoten and rightly so. 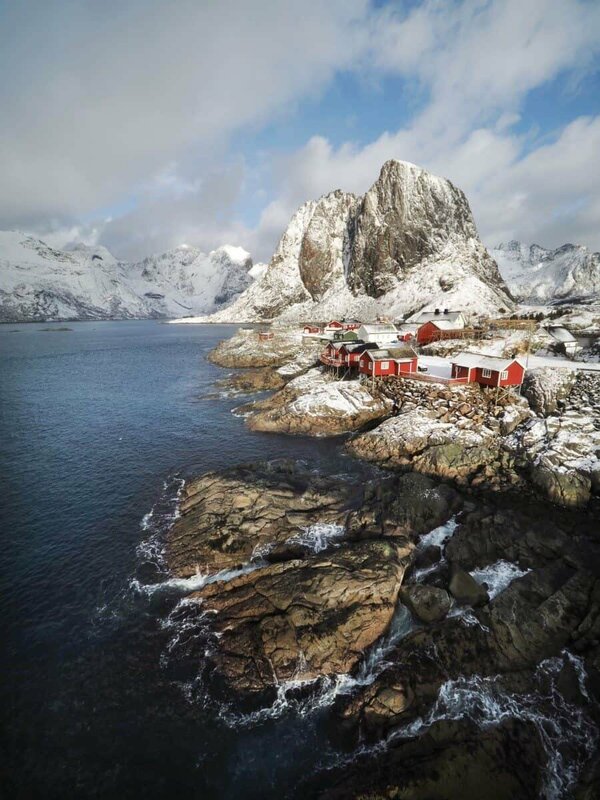 Looking over a collection of red Rorbus (traditional fishing cabins), there’s the mighty Festhelltinden mountain looming above and waves crashing onto the rocks below. To capture the true potential of this view, it’s essential to visit more than once. Morning light, afternoon warmth and long exposures of stars or aurora overhead. It’s popular for a reason so look for a creative angle to showcase it with your own perspective! The good news is that this bridge is long enough to ensure it’s never too crowded with photographers…there’s space for everyone. Also don’t be put off by a snow storm and strong winds (unless it’s of course too dangerous to go outside). 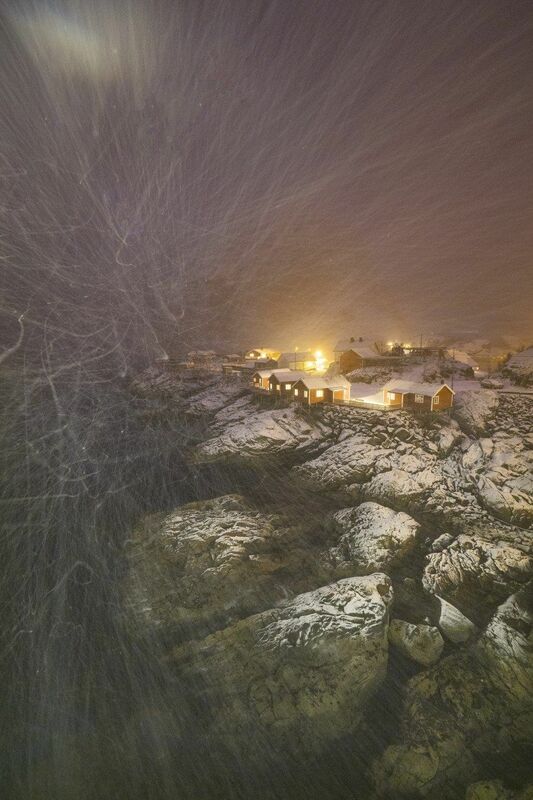 The lamps on the bridge create a great light source to highlight fast moving snow which offers another perspective to not only show this location, but the extreme conditions of Lofoten. If you want to stay nice and close to the bridge, I recommend the Eliassen Rorbuer which are actually the red cabins pictured! Once you’ve crossed the Hamnøy Bridge on your way east, pass the turn off to Eliassen Rorbuer and continue around the corner. 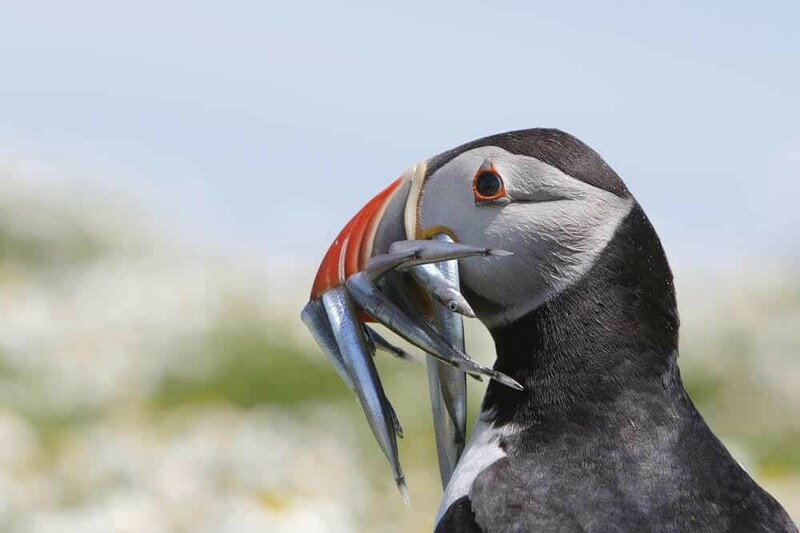 Once the rocks have subsided you’ll be treated to an incredible view looking across to fishing boats and red Rorbus. Behind are the immense slopes and cliffs of Olstinden and Navaren which dwarf the foreground scenery especially when using a zoom lens. Pronounced ‘ohr’ rather than ‘a’, this village marks the end of the road. 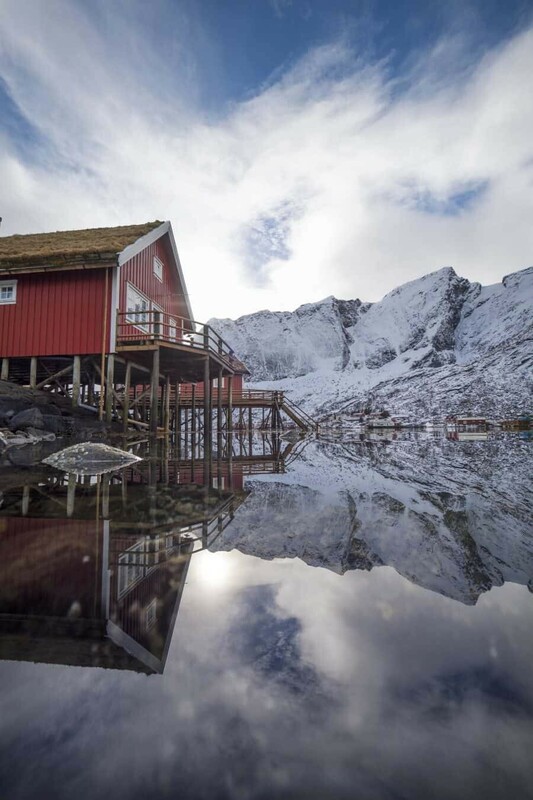 Drive as far as you can to the south and you’ll arrive in Å, a photogenic fishing village with historic huts and of course, the ever present mountain scenery. Take a wander through the village to peek at an array of building styles, then head down to the harbour to capture the nautical beauty. There’s a floating pontoon which offers a fantastic opportunity to capture split-level underwater shots looking back towards the Rorbu cabins and cliffs. Or if you’re not as obsessed with that perspective as I am, it’s also a great perspective to get some shots from the water level. 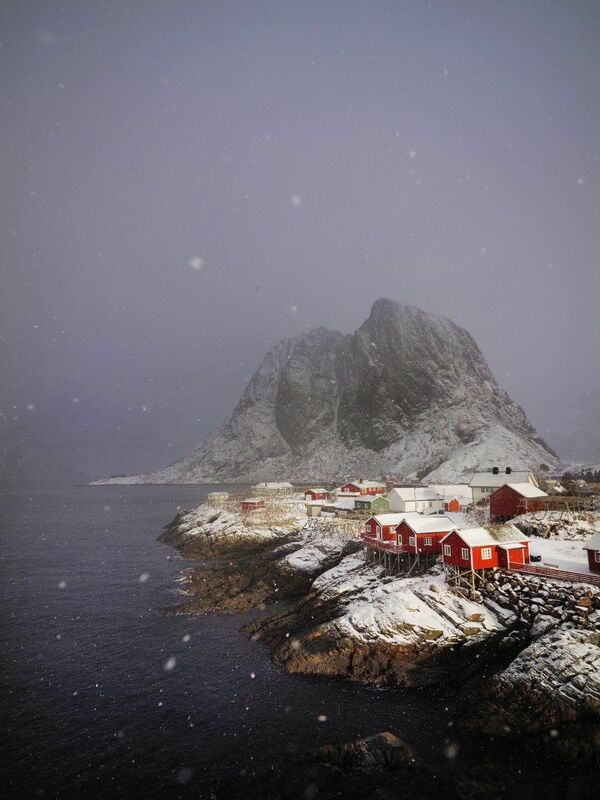 Tucked in a narrow fjord away from everything, Nusfjord is perhaps the most beautiful village in the Lofoten Islands. 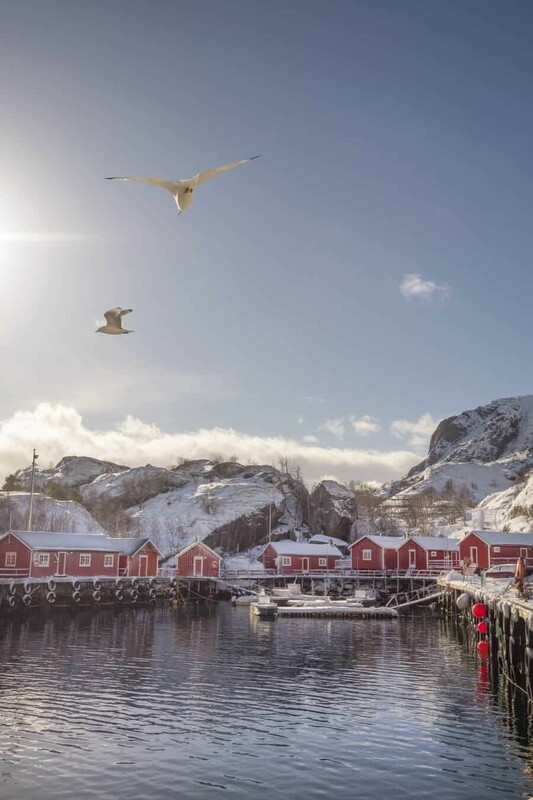 Around the tiny harbour you’ll find brightly coloured fishing cabins painted in bold yellow and red, with seagulls flying above and boats bobbing below. The drive to Nusfjord is also extremely photogenic. Passing lakes and winding around the base of Svadet peak, it’s essential to allow yourself enough time to soak it all in. Visit this beach! You will no doubt drive past Rambergstranda Beach as you venture around Lofoten but I think everyone needs to stop here and have a little wander. If for no other reason, it has perhaps the most scenic little cabin I’ve ever seen. A short walk from the car park at the northern end of the beach is a red cabin resting perfectly with the coastal scenery behind. Take the turn off towards Fredvang and drive over the series of bridges towards the north. 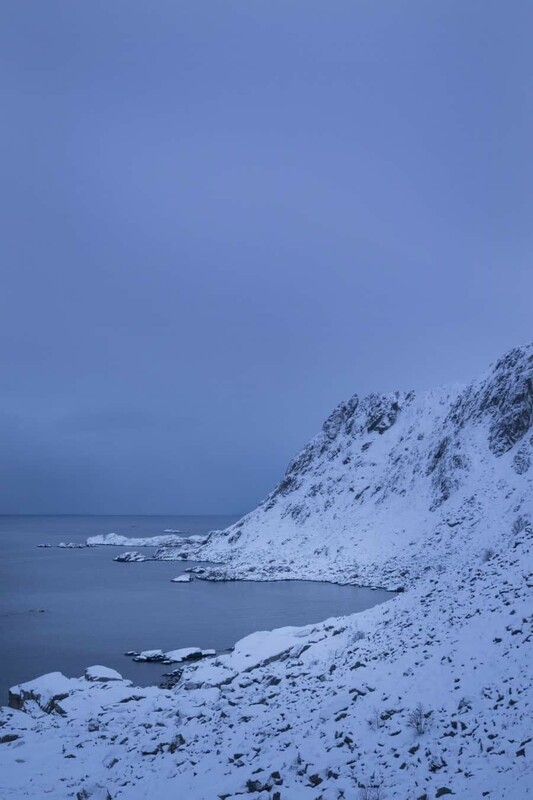 Following the road to the end you’ll arrive at Sandbotnen Bay which overlooks the Arctic Sea with ridges to the west and east creating beautiful photo opportunities. Rather than driving back over the bridges, turn towards Fredvang and the road continues alongside the beautiful Torsfjorden. 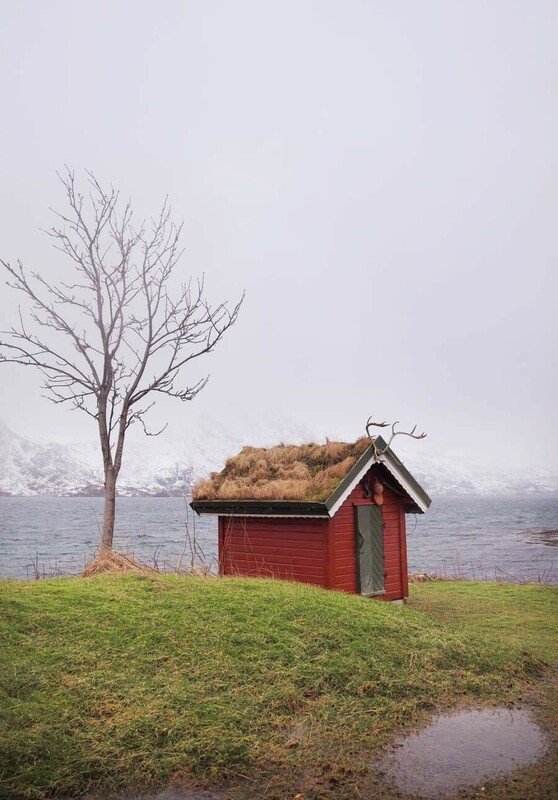 There’s numerous opportunities for reflections on a calm day and you’ll also find cute little huts some with the grassy rooftops and others decorated like the one below. Also just as a note, the road won’t link back around to the E10, you’ll need to turn back and cross the bridges again. The little town of Flakstad has a number of subjects to photograph, not only landscapes! While the beach is a popular location with photographers, I found the cows and horses much more fun! 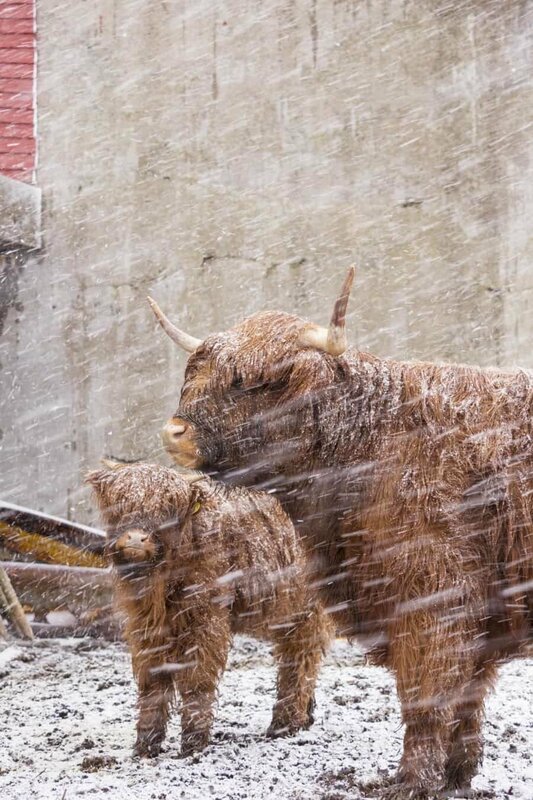 One paddock in particular had a herd of Highland cows with their long woolly hair and big horns, in a snow storm they fitted the mood perfectly. Flakstad Beach provides lots of opportunities to photograph in rock pools with the mountains behind or to capture patterns in the sand as the chilly water runs down to the shore from streams. 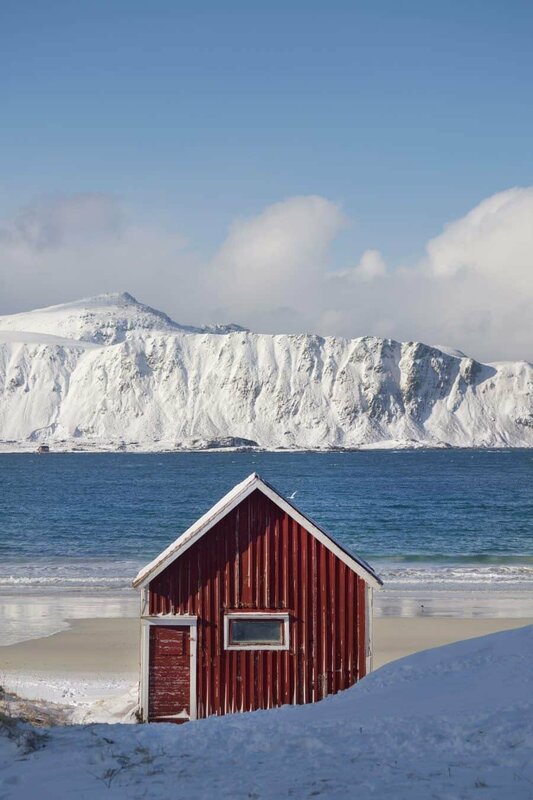 Just behind the beach is the Flakstad Church, a bright red timber building with sharp angles that was built in 1780. 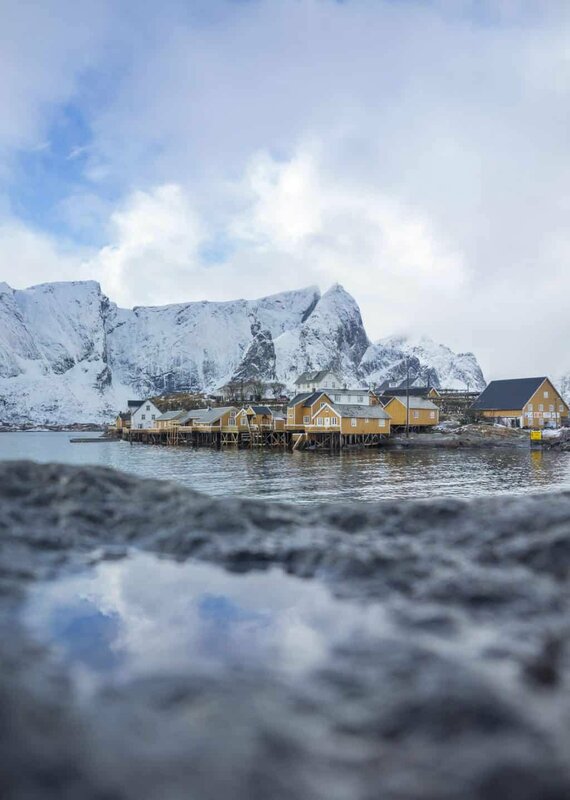 Nestled between Reine and Hamnøy you’ll find the little gem of Sakrisoy. It’s a fishing village where fish drying racks line the rocks and stunning mountain backdrops venture far into the distance. There’s also a change in colour here with yellow the dominant tone contrasting beautifully against the deep blues of the surrounding fjord. It’s a really tiny village so be sure to have a wander around and try to see it from all angles! One of the first villages you’ll come across when arriving by ferry into Moskenes, Reine is a little Norwegian delight. 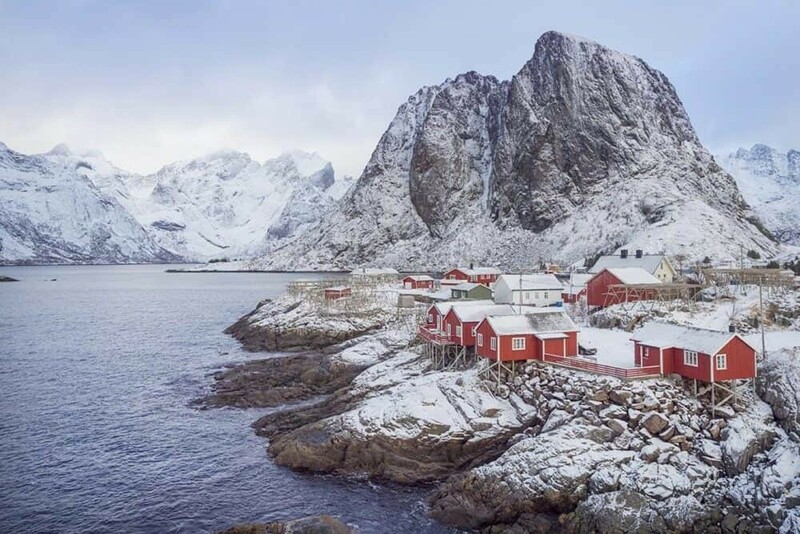 It’s exactly what you picture a Lofoten fishing village to look like with red Rorbu’s, drying racks and towering rugged peaks above its shore. There are many vantage points in Reine, the first and most popular perhaps is a wooden bridge linking to a small island just beside the E10 (Lofoten’s main road). If you’ve got a wide angle lens, this spot is incredible in the evening with glowing lights and fingers crossed…aurora overhead! On the northern end of Reine you’ll drive across a one way section of road that bends around toward the local Coop supermarket. Try and find a place to park your car then walk back to the road for a great view across the Reinevagen Bay. Reflections can be found from every angle on a calm day so be sure to climb down to the water level and look left and right to capture the mountains on either side. In winter you may find Rambergstranda Beach is completely iced over so take care when walking down on the sand…don’t do what I did and think you’re at home in Australia then, whoop, over you go. There’s plenty of little streams running down to the water also which can offer an alternate angle. If you’re following the E10 route around Lofoten, it definitely pays to turn off it every now and again to explore some of the lesser visited locations. One of those is the road to Vitken. 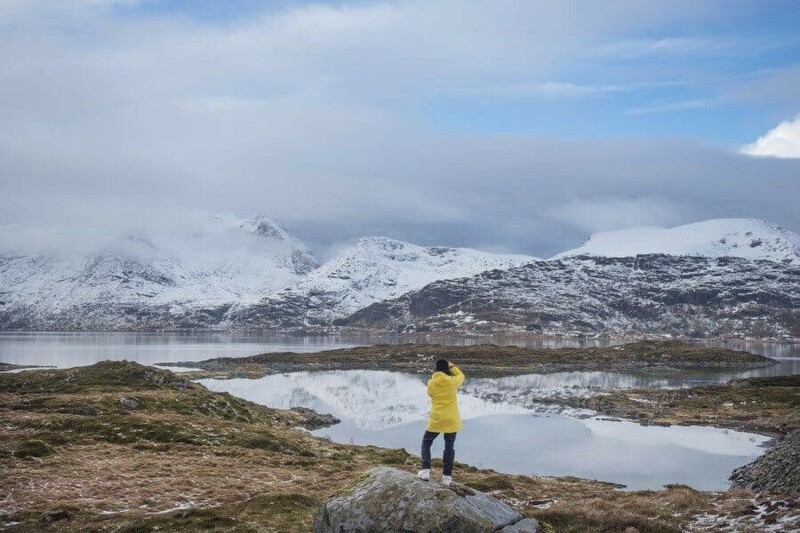 Less than five minutes from the turn off is a rocky coastline that’s ideal for capturing shots of someone with the iconic Lofoten mountains behind. It’s totally gnarly dude. Okay so I’m pretty sure I’ve never used the word gnarly on this site before but it’s completely worthy now. 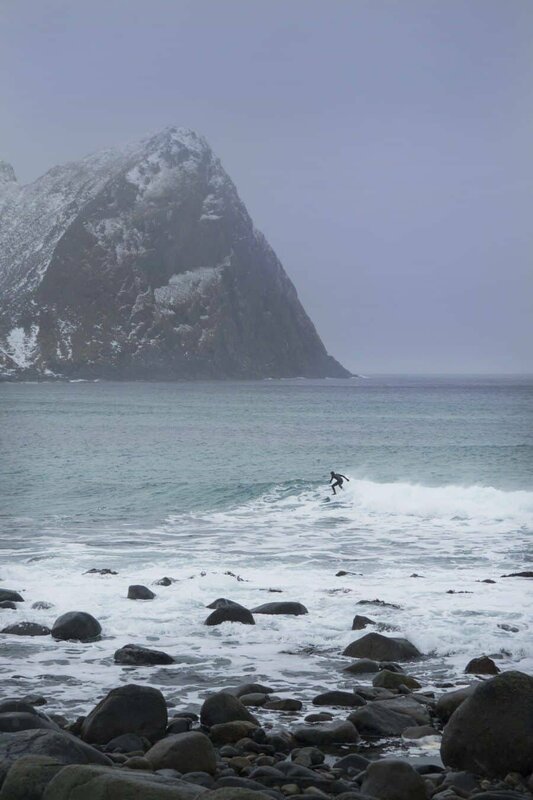 Unstad is where Arctic Surfers gather to surf some impressive swells that roll in from the Arctic Sea. Sure the water is freezing but when the waves are pumping someone has to surf them! The landscape creates some stunning backdrops with dramatic cliffs dropping into the sea as tiny wetsuit clad surfers paddle below. 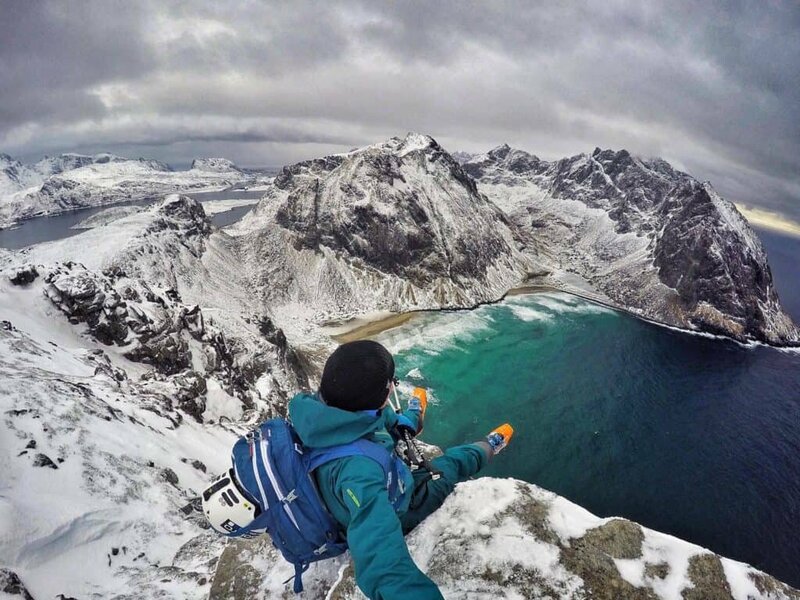 To capture the vast beauty of Lofoten it’s essential to get up a little high into the mountains. Around the winter months this can be challenging due to too much snow, ice or the risk of avalanches however in summer or in the shoulder seasons, hiking is a great way to photograph the landscapes. 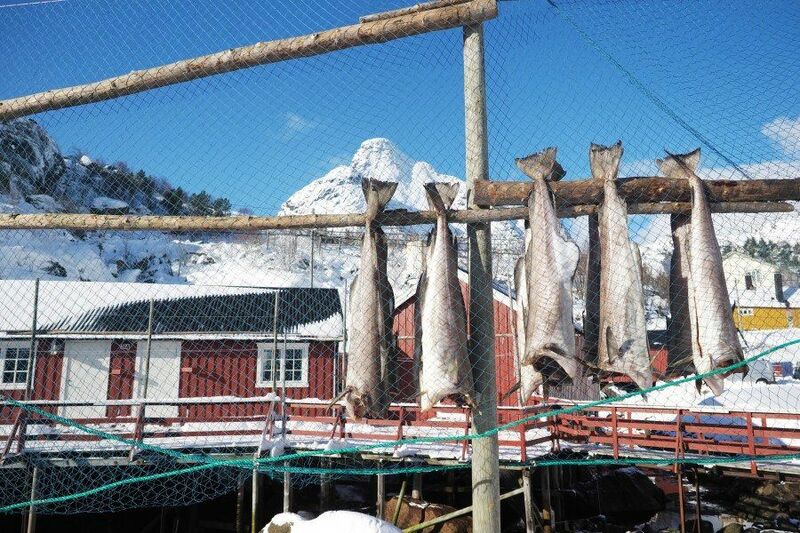 One particular hike we attempted during our stay starts in Ballstad, just behind the fish drying racks opposite Kræmmervika Havn. Kristian from Hattvika Lodge regularly takes guests up to explore the Nonstinden and Ballstadheia ridgelines which offers views across Ballstad and some epic scenery below. Sunrise is a great time to capture the morning light revealing the mountains and fjords one by one if you don’t mind an early morning hike in the dark! 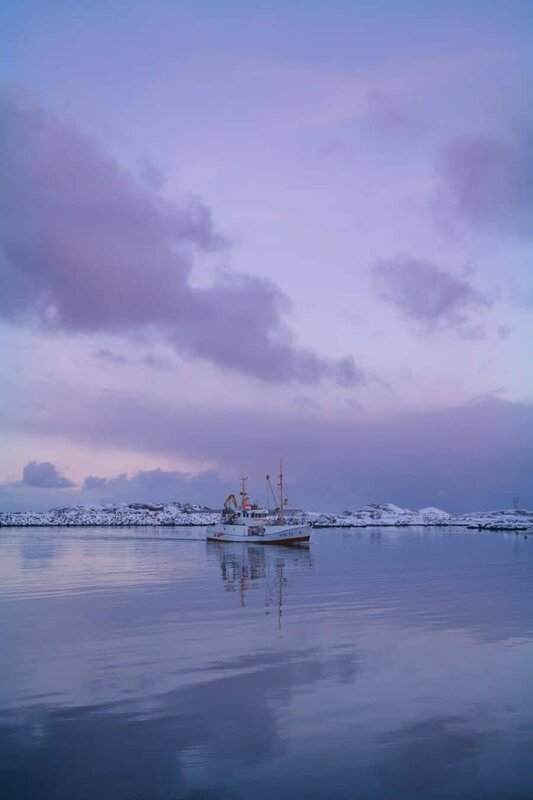 As the busiest fishing village in the Lofoten Islands, there’s always something to photograph by the harbour in Ballstad. 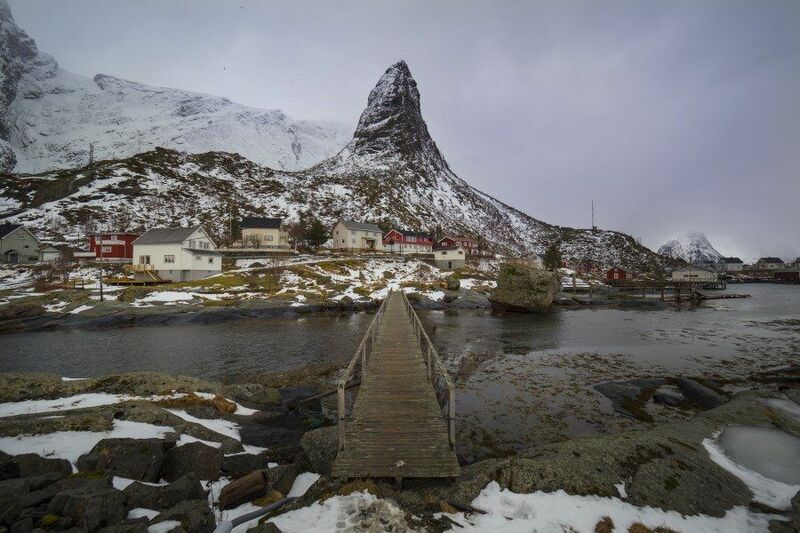 Walking from the Joker supermarket in town, wander around on the wooden jetty towards Hattvika Lodge and you’ll find fishing boats arriving, seagulls hovering above and rows of rugged peaks in the distance. 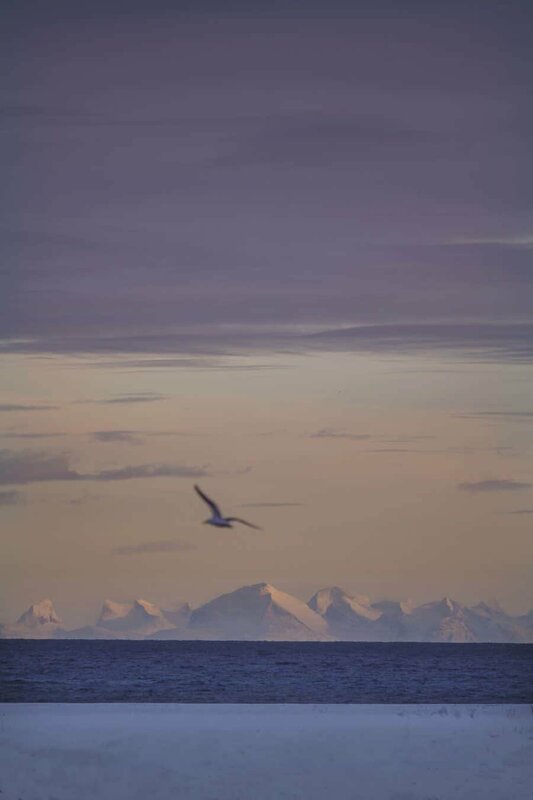 Be sure to take your zoom lens with you in order to capture the scenery all the way back on the main Norwegian coastline, or to take a closer shot of the Nonstinden Peak mentioned in the previous section. 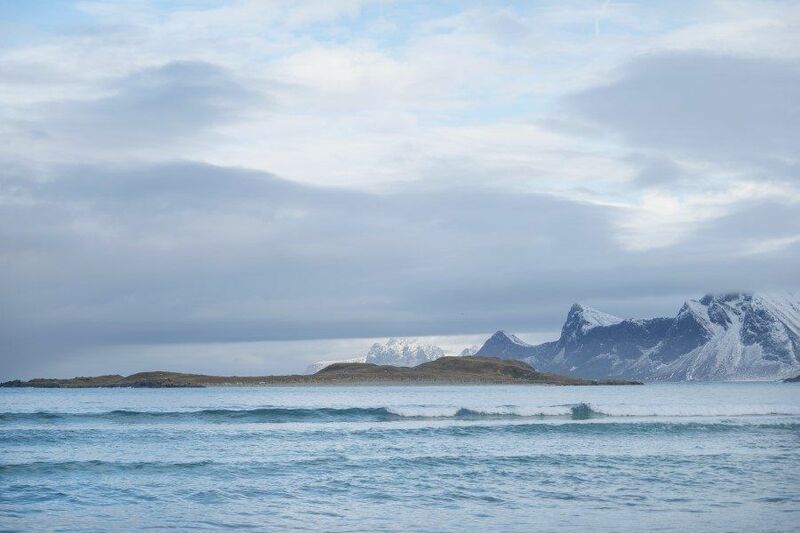 Ruggedly beautiful yet peacefully pristine, these two beaches sit side by side but are separated by one very tall mountain peak called Veggen. Bright white sand leads into teal clear water with rocks lining the shoreline and mountains framing the scenery from almost every side. Once you’ve captured the beaches, it’s possible to hike around the base of Veggen on an old road which is now used by hikers and locals for fitness. So there’s one place I really, really wanted to visit but due to the wild weather was unable to access. 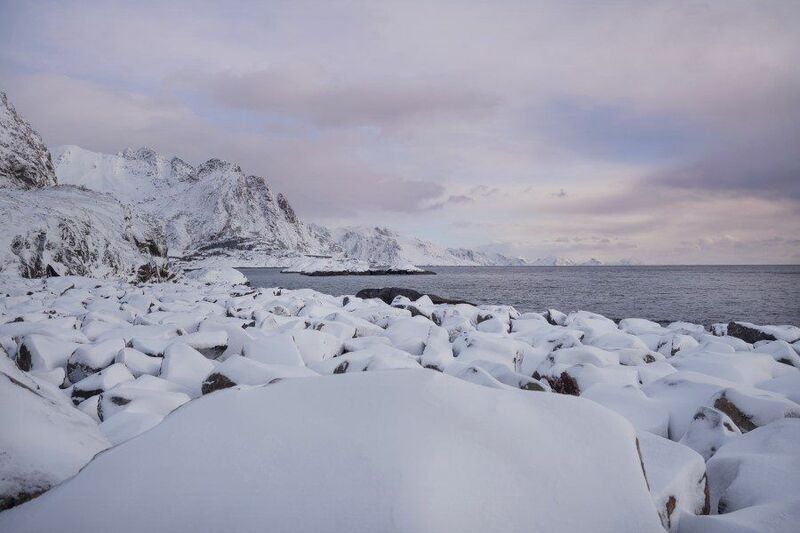 Ryten Peak offers an incredible opportunity to see the Lofoten scenery from above looking over the stunning Kvalvika Beach. While it’s possible to hike just over to the beach, if you’re in Lofoten and the conditions are right, it seems completely worth it to hike to the top for a view like nowhere else on earth! Take a peek at this shot captured by Kristian from Hattvika Lodge…see what I mean? Worth every second of pain to get to the top! To start the hike drive through the village of Fredvang and after a few minutes you’ll come to a parking area on the left beside the fjord. On the right side of the road is the start of the hiking track to Kvalvika Beach. To access the peak it can be less steep to start back closer towards Innersand. As I haven’t personally done the hike it’s best to check with locals once you arrive for the recommended route at the time you’re there. Click the map below to open it in a new tab or directly to Google Maps on your phone. 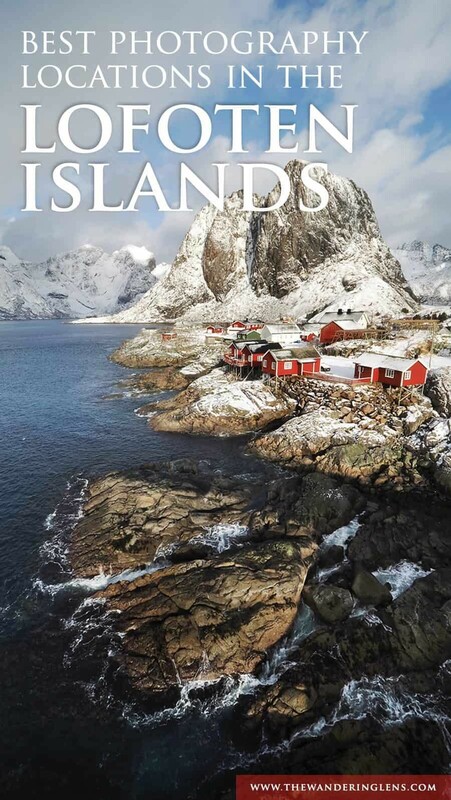 You can take this with you to explore the region and find each photo spot in the Lofoten Islands noted within this guide. Of course there are plenty of stop by the side of the road locations that aren’t noted in the map below but I’ve listed every spot that caught my eye or is worth visiting due to it’s photogenic scenery. You’ll find these gems in Northern Norway above the Arctic Circle so it can take a little while to get here regardless of where you’re travelling from. The travel time though is completely worth it! Flying: You can fly to Leknes in the Lofoten Islands usually with a connection through Oslo then Bodø where you’ll change onto a smaller plane for the trip across the sea. Ferry: If you’re looking to rent a car for your trip to the islands, it can work out cheaper to hire it in Bodø and you can then jump on the car ferry. Check for latest ferry times on the Torghatten Nord website as they change depending on season. Just a little warning for the ferry, you are crossing a section of Arctic Sea so if the winds are strong the waves can be quite uncomfortable if like me you get a little seasick. Have some seasickness tablets ready for the crossing should the weather turns wild! 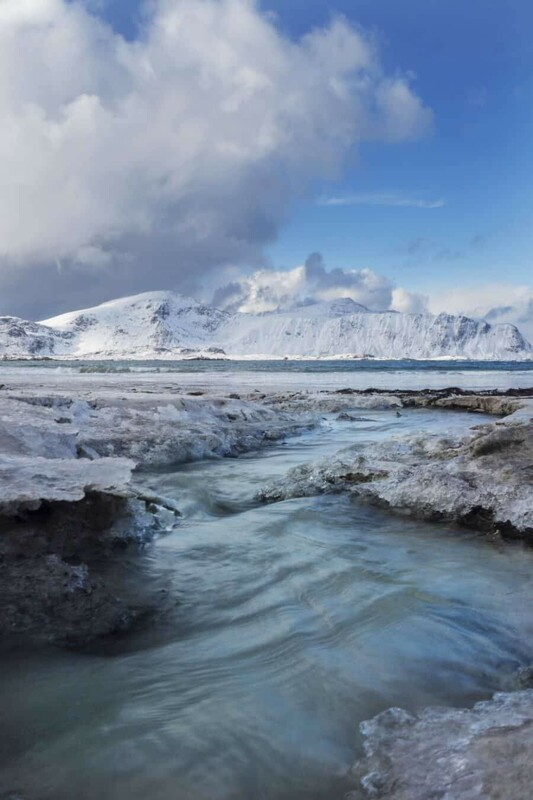 Car: If time isn’t an issue and you are keen to explore more of Northern Norway, you can fly to Tromso or Bodø, hire a car and make a proper road trip of it! The drive from Tromso is roughly 8hrs to Leknes or from Bodø it’s a little longer at around 12hrs. The Lofoten Islands are actually quite small so it can work well to base yourself somewhere and head out on daily adventures. The drive between Leknes and Reine is just over an hour which means there’s plenty of time to stop, wander and explore everywhere along the way. Hattvika Lodge is located in Ballstad and guess what, they LOVE photographers! 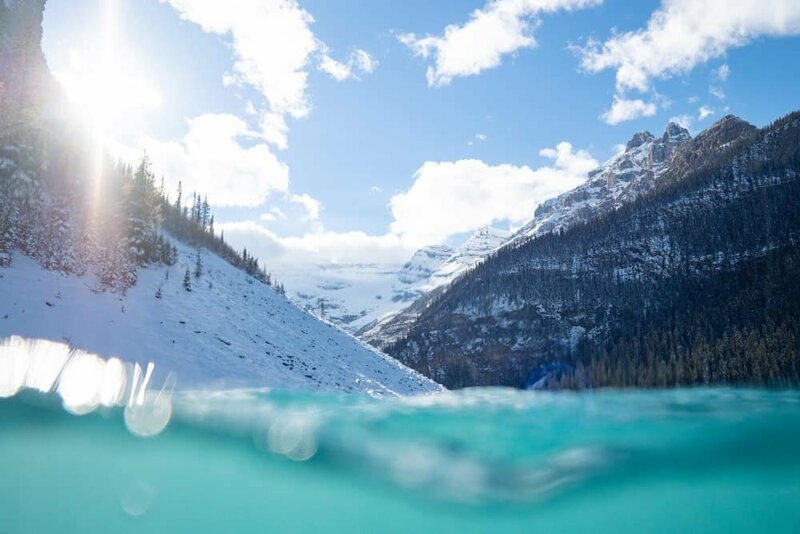 Kristian will tell you the best places to hike, kayak and photograph based on the conditions during your stay and sometimes he might even join you for the adventure. 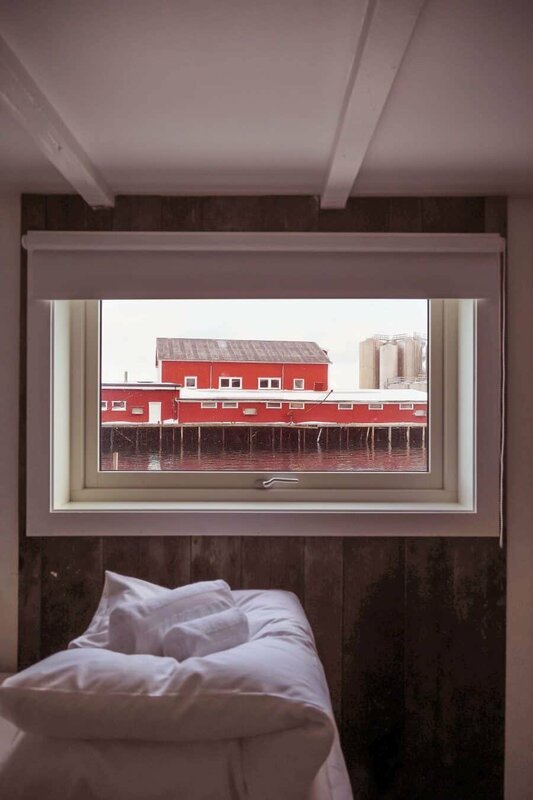 The lodge itself is stylish, luxurious and located right by the sea on an old fishing dock meaning you can watch the boats come and go from the comfort and warmth of your room! Keep an eye out for my visual review of Hattvika Lodge coming soon. 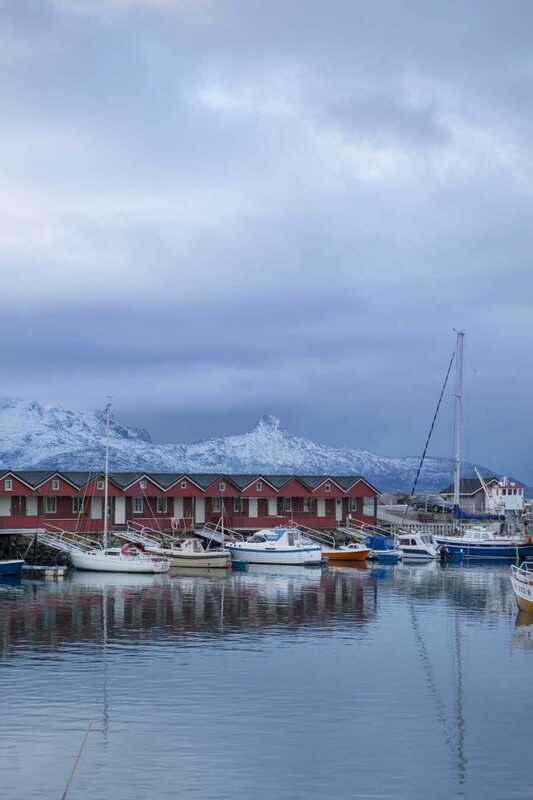 Read my Visual Hotel Review here – ‘Where to Stay for an Adventure in the Lofoten Islands‘. Eliassen Rorbuer are the red cabins you’ll see in every image taken from Hamnøy Bridge. 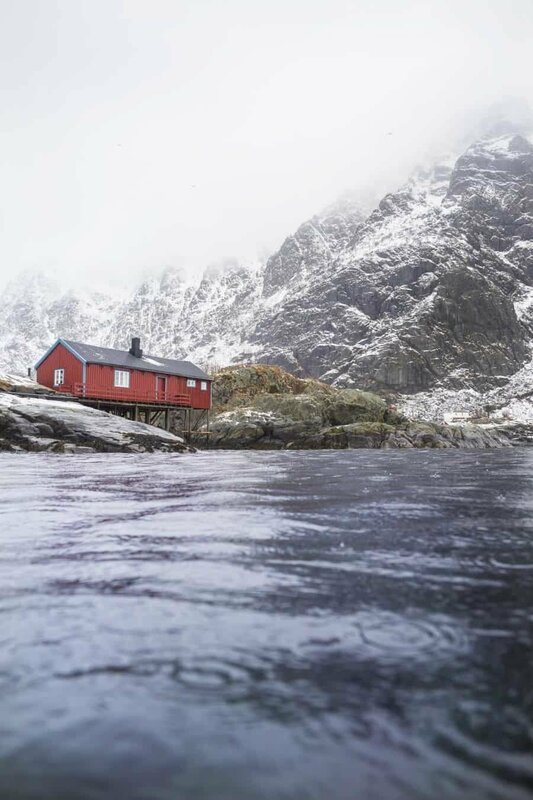 You can rent a cabin for your time in Lofoten Islands however you’ll find they will fill up very quickly so you have to book quite far in advance. Click here for reservations. 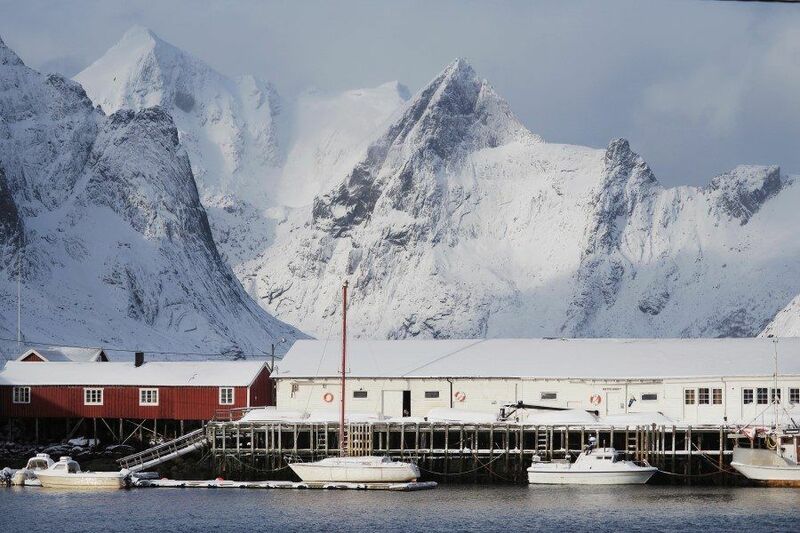 Accessing Lofoten is popular via Bodo, a city on the coast of Norway about 3.5hrs by ferry from Moskenes, Lofoten. It’s best to hire a car in Bodo too so can be handy to spend the night in town before venturing across the fjord to the islands. In Bodo I can highly recommend the Scandic Havet Hotel which is right on the waterfront in the centre of town and only 2minutes drive from the ferry departure point to Lofoten. It’s stylish, has views over the sea and from your room you can keep an eye out for aurora! The rooms and hotel interiors are all themed around water, with colourful displays in the foyer, lifts and beautiful images throughout the rooms. If you’re after something a little more local, the super cute Opsahl Gjestegaard is the place to stay. With rooms decorated based on periods of Norwegian history, hallways filled with ornaments, collectables and costumes it’s a little like staying in a museum. The guesthouse is just a few blocks from the centre of town and about a 3-5minute drive from the Bodo airport. Click here for reservations. 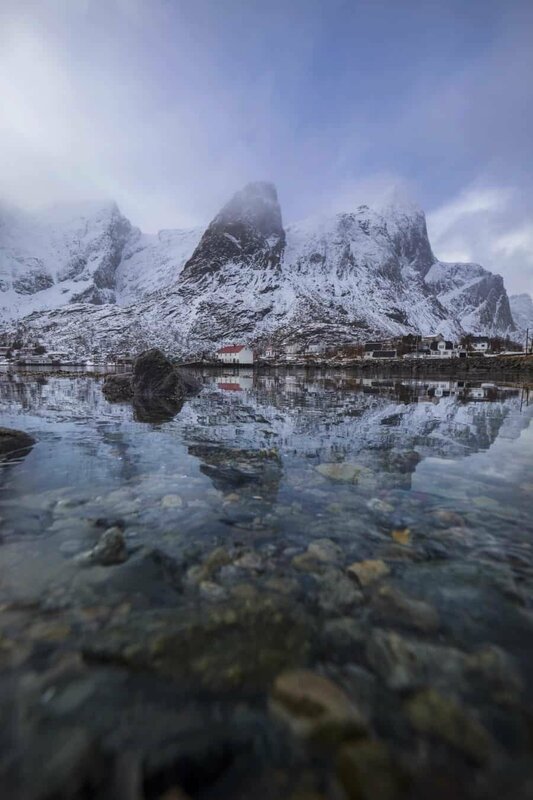 Depending on what you wish to photograph, the Lofoten Islands can be photogenic at any time of the year. Some months however are a little more pleasant than others. September to March is the best period to photograph aurora as you’ll need dark, clear skies to see them dance overhead. The middle of winter though can be quite harsh with limited hours of sunlight, especially in late December and early January. March will ensure you still have lots of snow on the mountains and a good chance of seeing aurora. There is also regular daylight hours meaning sunrise is around 6-6:30am and sunset about 5-6pm. As March is still considered a winter month the weather conditions can change very suddenly and at times it can become quite windy and wild. From May to August the increased sunshine allows for more outdoor adventures. If you’re keen to hike it’s the best time of year with the appearance of the midnight sun. If you like photographing warm light as much as I do, it’s a great time of year with hours upon hours of gorgeous colours. So, what are you waiting for? If you end up in the Lofoten Islands, share a link to your photos in the comments below or use #thewanderinglens on Instagram. All images featured in this guide were captured using the weatherproof Olympus OM-D E-M1 Mark II. Thanks to Northern Norway for making the trip to scout locations possible. Wow I didn’t realise such an amazing place existed . You’ve covered it so well. I’m planing to visit in 2018 . I will know where to go now! Great to hear Michelle! There’s so much to explore, be sure to hire a car if you’re hoping to see a lot of the places listed above. This is actually super useful for me too because I definitely forgot the names of half the places we visited, haha. Need to print it out and put it in the old memories box. This is such a stunning destination! We love hiking, landscapes and this is just perfect. I was wondering if you have any idea about prices? This place might have stolen my heart! Hi Telma, so lovely to hear Lofoten has taken your heart! Price wise will differ depending on which season you visit with summer the most expensive and winter more affordable. That said, in winter is a little harder to travel around with less frequent boat schedules etc and wild weather…so snowy and gorgeous though! 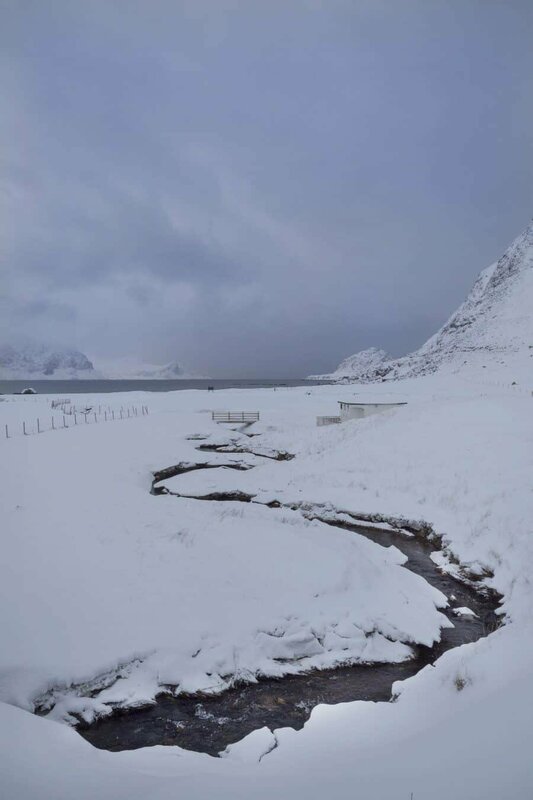 You can find a guesthouse or cabin in Reine or Ballstad from around 80-100USD per night some with 2-3bedrooms so if you’re travelling with friends it’s really affordable. The ferry from Bodo across to Moskenes is 30euro per person one way and then to take a car was roughly 60euro but again this will probably change per season. The most expensive part of the trip will probably be the flights. Other than accommodation and car hire though, the rest of Lofoten is a natural playground so you won’t be spending money on entrance fees etc, it’s all accessible and just a matter of how far you want to walk! What a stunning selection of photographs! Thank you for putting all of the best photo spots on the map, as this is something to be really saved in the “favorites” section when I finally plan my trip here! I had heard many good words about Lofoten Islands, but your post is really the one to make me want to go there! I looove the pictures! The second one is super cool. The Lofoten Islands look amazing and are slowly creeping up my list of places to see! These photos are BEAUTIFUL! I am Norwegian, and Lofoten has been on my list forever! I can’t believe I haven’t been yet! Thanks Lisa! 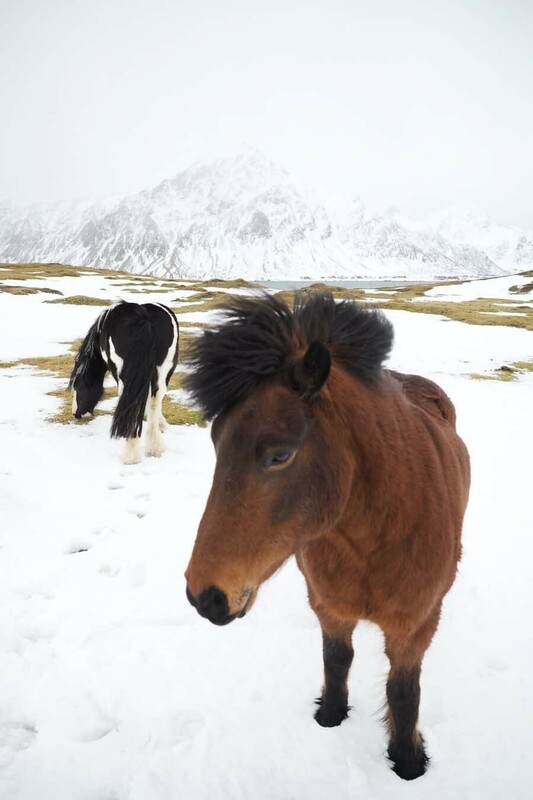 With a blog name like Fjords & Beaches I think the Lofoten Islands are basically calling for you to visit! These photos are gorgeous! It makes me really want to visit Norway. 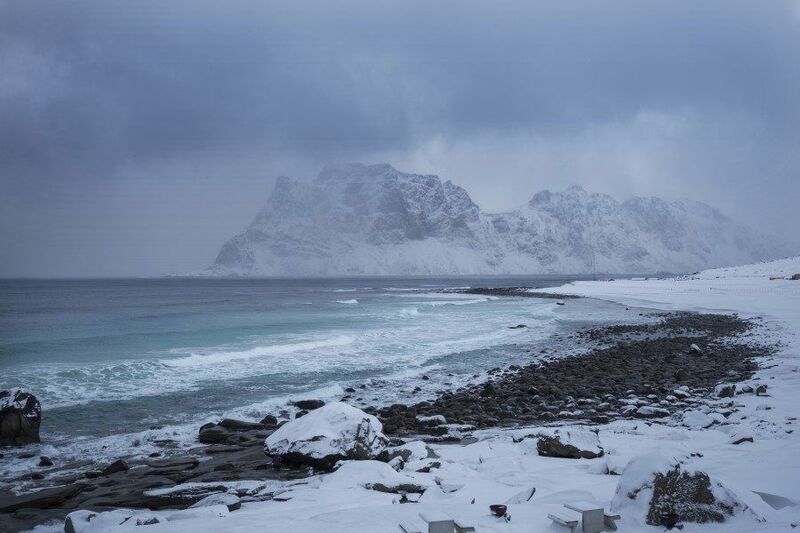 I just love how dramatic all of Lofoten is! I was shocked at just how high the mountains rise from the sea…so dramatic! Thanks Irina! Hopefully you’ll get to visit soon! Can’t. stop. looking. at. your. photos!! great blog and amazing pictures! I enjoy shooting in the winter and thanks to you this place is now on my list.Thank you! All of your shots are simply beautiful! Love all of the little huts with their grassy rooftops, think I’ll have to go and hunt some out for myself! Beautiful photos, of course! 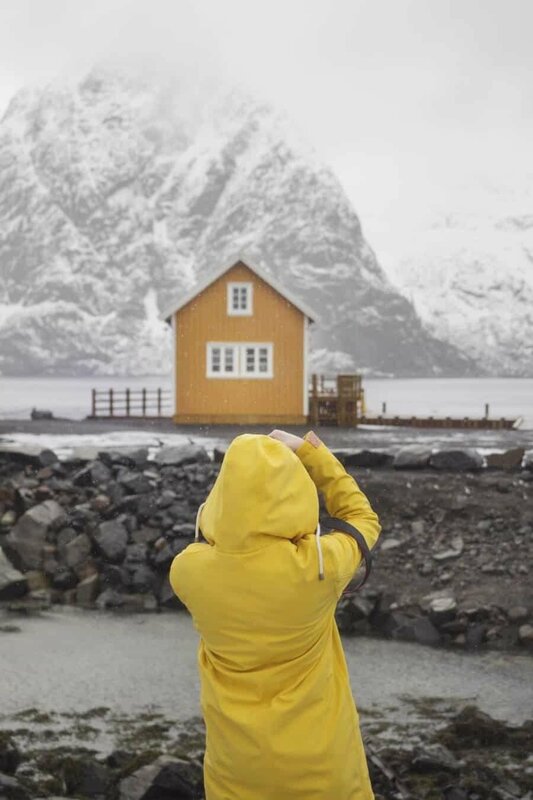 If I ever make it to that part of Norway, I’m definitely packing my yellow raincoat. I can’t believe how freaking gorgeous this is!! I’m dying to visit Norway and I’m saving this for a future trip. It’s seriously stunning up there Lia! Definitely worth a visit! I was wondering if you have been to the Lofoten, and I see that you have. To me, it’s the most beautiful place on earth – although I know there’s still so much of this world I have to see. Yet, my love for Scandinavia makes me biased and the Lofoten are just the best that Scandinavia – and Norway in particular – have to offer. I have visited the archipelago at the end of May, a gorgeous time to travel in Norway if you will ever plan to go back. I definitely want to go there again in winter, and I think that March is definitely a great time, especially for the hours of daylight compared to other winter months. Thanks for these beautiful photos. I am going on a cruise around the Norway fjords from Kirkenes down to Bergen. I have a Nikon D7000 and would love to have your advice on which lens / lenses to get. Thanks in advance and congratulations for this site and the pictures! Hi Jacques, great to hear you’re visiting Norway soon! For the fjords you’ll want a nice wide angle for landscapes something like a 14-24mm but it’s also handy to have a zoom lens to capture the details of birds, waterfalls, mountain peaks. 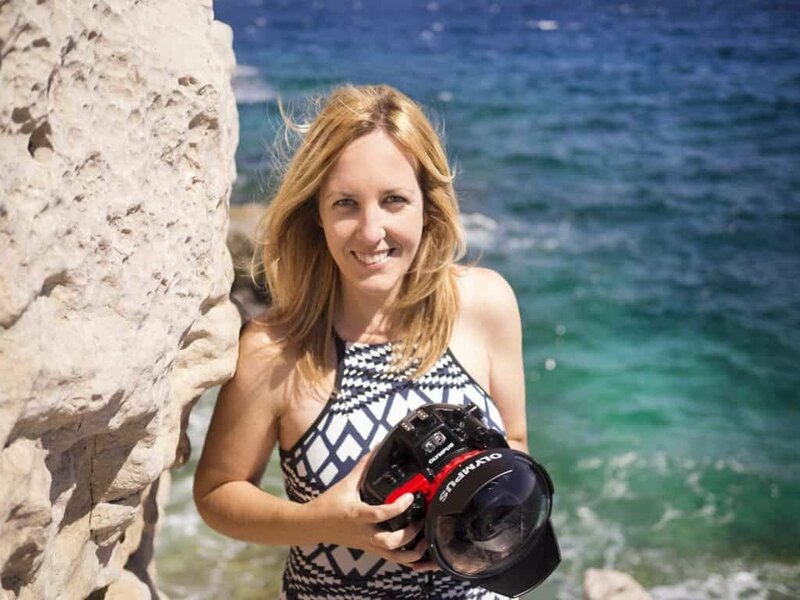 I travelled with a 28-300mm Nikon lens for a while and loved it! Having a zoom lens that covers a big range will allow you to keep it on most of the time as you don’t want to be swapping and changing too much if the weather is windy/wet. Have a great trip! Some absolutely stunning photos! 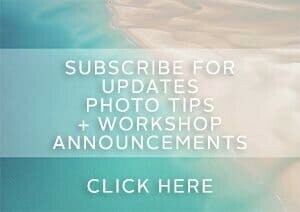 Also a great travel blog. Thanks for then effort you put in. Just wondering if you stayed in true same hotel each night and did day trips or if you stayed in different places. On the map everything seems to be on that Southern tip of Lofoten. Did you go anywhere else? 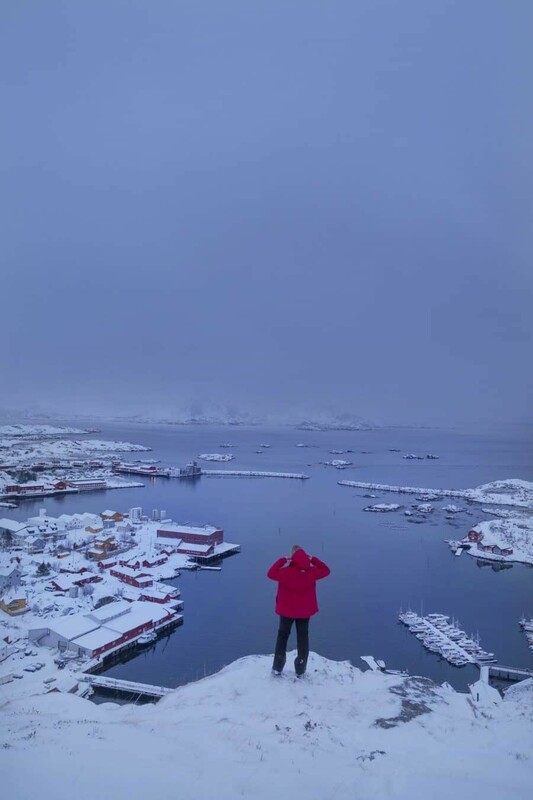 Was there nothing around Svolvaer to photograph? Sorry if there a lot of questions. I’m heading there in a month. Trying to get an idea of great things to see and photograph! Hi Sam, I’m just a little jealous you’ll be visiting next month! Lofoten is beautiful no matter where you are but the majority of the photogenic spots and those that you’ve seen on Instagram etc are down towards the southern tip between Vestagoy and Reine. We went in the midst of winter so it was a little harder to travel around with the icy road conditions and numerous snow storms. 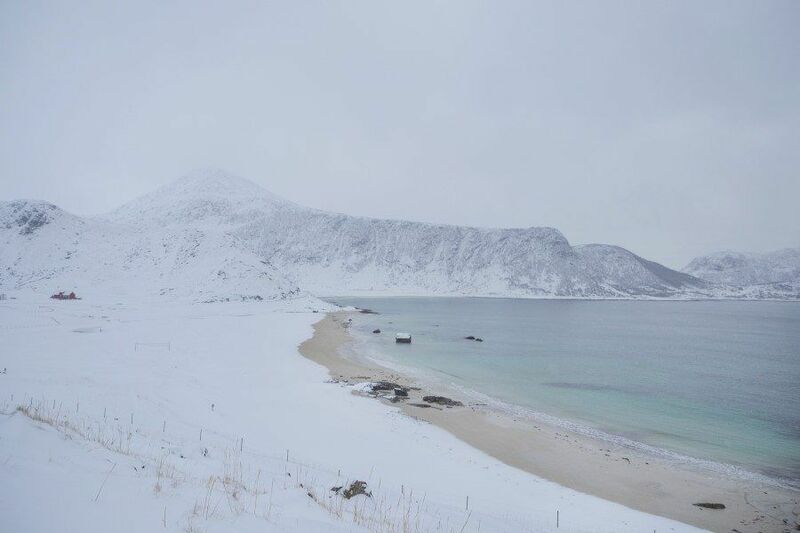 My favourite areas were Unstad, Haukland Beach and Hamnoy. In winter I found it easier to have a home base and do day trips but if you’re going soon, you can probably mix it up a little. Reine/Hamnoy is a great base and so is up in Ballstad, I loved Hattvika Lodge! You wrote an amazing guide. I’m also the author about the Lofoten Islands. But you did really great work.